At $3 per dozen, the eggs have a recall value of $57 million. The median priced Toyota is $23,000 multiplied by 11 million is $253 billion. According to Toyota's measure, the chickens would need to lay 4400 times as many bad eggs to catch up. Henrietta Penny, spokesperson for the egg producers said, "Dollar value is not the way to calculate the impact of these recalls. You need to factor in the likelihood of Joe 6-pack being affected. 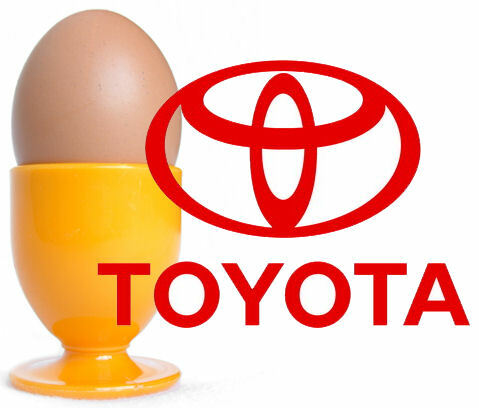 In 2009, only 0.34% of households in America bought a Toyota, compared to 88.9% of households buying eggs. The facts clearly show that our recall is greater in unit volume and also in impact to the American public." AT&T have denied rumours that they planned to make a bid for the top spot by issuing a text message recall for later this year. Garmin have entered the race by recalling 1.25 million GPS units with possible fire hazard issues. Maybe Toyota should be in the egg business...better chances of recovery, perhaps? "This is your brain..this is your brain on drugs. Any questions?" "Yes, why do I have an egg for a brain?"